The eleventh meeting of the Horseracing Bettors Forum took place in London on 16th April 2018. What follows is a note of that meeting and some of the topics discussed. Paul Johnson and Stu Middleton introduced the work of the BHA Racing Department, which includes three areas: Fixture List, Race Programme and Race Times. Areas of discussion included the 2018 Appearance Money Scheme (AMS), the Fixture List consultation process, and the racing product on Sundays. HBF members agreed to draw the consultation phase of the Betting Charter to a close, and are looking to formalize a final version before the next meeting (July). The next meeting is scheduled for Monday, 9th July. The Horseracing Bettors Forum has undertaken a study into Starting Prices in Britain in 2017, measuring the “over-rounds” compared to what might be expected given a race’s field size. “Over-rounds” are the bookmakers’ theoretical mark-ups and are derived from the sum of the amount that would need to be staked to return a fixed figure at each of the prevailing prices. For instance, you would need to stake £20 at 4/1 to return £100 (your £80 winnings plus your £20 stake) but just £10 at 9/1. If you add up all of these stakes it indicates the amount which would need to be invested in proportion to the odds of all of the runners in a race to return £100 regardless of the outcome. In nearly all instances, this figure will be larger than the £100 returned. You might need to stake £110 to guarantee a return of £100 come what may, or you might need to stake £120 to do the same, depending on how much the prices are in the bookmakers’ favour. The difference between the amount staked and the amount returned – 10% or 20% perhaps – is the theoretical “over-round” which works in the bookmakers’ favour (though at this stage it must be acknowledged that a bookmaker is unlikely to lay every horse in strict proportion to that horse’s odds). Over-round is affected by field-size, but not in a simple, linear, fashion. That is why a measure other than over-round-per-runner needs to be used. HBF used an equation derived from a study into Starting Prices in 2014 by HBF member Simon Rowlands (https://www.timeform.com/horse-racing/features/rowley/Rowleyfile_Investigates_The_Industry_Starting_Price,_part_one) and then established the degree to which actual Starting Price over-rounds differed from that simple prediction. The following are some of the findings. Summary tables can be found at the bottom of this piece, but it is worth just dwelling on the figures by individual course. 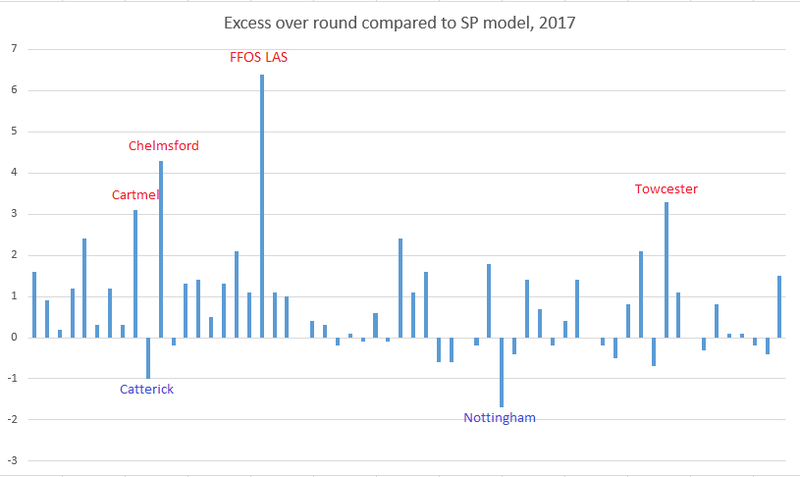 In particular, the over-rounds at Ffos Las in 2017 were frequently out of kilter with what might be expected and merit investigation. These include a card at Ffos Las on 25th August, 2017, when the following betting percentages were returned: 122% for a 6-runner handicap; 128% for an 8-runner handicap; 142% for a 10-runner non-handicap; 130% for a 7-runner handicap; 128% for a 7-runner handicap; 136% for a 7-runner handicap; and 131% for a 5-runner handicap, all of which figures greatly exceed what might usually be expected. The returns for the card on 17th July, 2017, were not quite so eye-watering, but they included: 135% for a 13-runner handicap; 133% for a 12-runner handicap; and 132% for an 11-runner handicap. Something odd is going on at the South-Wales course, with nearly all races disadvantageous to punters betting at Starting Prices compared to expectation, and sometimes by large amounts. Ffos Las may be a course to steer clear of until an explanation – not to mention a solution – has been provided. In the below table, the figure given is the over round compared to par, with a positive value an excess (i.e. poorer value betting track than par) and a negative value a better value betting track than par. The Horseracing Bettors’ Forum would like to publicly state that it has no confidence in the current Starting Price Regulatory Commission, the SPRC. In today’s world regulatory bodies have to be open and accountable to their stakeholders and to clearly demonstrate the integrity of their decisions. The SPRC fails to do either of these. There are no minutes published of meetings or discussions this organisation has and in their most recent report they dealt with a potential conflict of interest scenario by one, unnamed, committee member talking to another unnamed “distinguished lawyer”. No reports of those discussions have been made available. To ensure the integrity of the SP or starting price, one of the lynch pins of horse racing, not only must things be done but they must be seen to be done. The days of regulatory bodies handing out rulings without explanation or discussion are long past. He apparently has no idea of the modern betting world or of its participants. He further has stated that “No one can ‘fix’ the SP”. This shows a degree of complacency totally incompatible with the imagination and preparedness needed in a modern regulatory body. The SPRC has a long history of trying to deflect criticism by saying its critics are seeking to abolish the starting price system. We would like to reiterate that this is not HBF’s aim. However HBF would like to see starting prices regulated by an open communicative organisation, responsive to the views of those it affects and with its members selected in a clear and open manner. Horse racing, bettors and the betting industry deserve no less. The Horseracing Bettors Forum (HBF), created with the assistance of the British Horseracing Authority to represent the interests of those who bet on British horseracing, has announced four new Forum Members as part of a planned refresh of its membership ahead of its second anniversary. Paul Johnson, Colin Hord, Colin Magee and Martin Hughes have been selected by HBF to represent the betting public and replace four of the original nine Forum Members. Colin Hord has already replaced Jason Brautigam – who left the Forum late in 2016 – and was in attendance at the Monday 3 July HBF meeting. Colin Magee, Martin Hughes and Paul Johnson will replace original HBF Forum Members Quen Emmenes, Glenn Alcoe and Scott Ferguson. All four new Forum Members are passionate horseracing fans and the last three will be joining HBF in advance of the Forum’s second anniversary meeting, which is planned for Nottingham Racecourse in October. Members will serve three-year terms and there will be another planned refresh of the HBF membership in 2018. “We were all very impressed with the standard of applications, which made the decisions regarding appointments difficult, and are confident that the new intake will ensure that the interests of the British horseracing betting public continue to be represented in an independent and insightful manner. HBF has meetings roughly each quarter and has lobbied on behalf of the British horseracing betting public with bookmakers and with bodies such as The Gambling Commission, The Information Commissioner’s Office, The Starting Price Regulatory Commission, The BHA and The Racecourse Association. HBF will continue to ensure a key customer group of British Racing is represented in the new Levy environment and is currently especially active in the areas of improved data provision for bettors, Non-Runners, the future of pool betting and the creation of a Betting Charter. It may be contacted through its website at ukhbf.org and its Twitter account at @HbfBritain. MATT BISOGNO, London, is a former software development project manager and consultant who is now managing director of the popular online racing community geegeez.co.uk. A passionate racehorse owner and syndicate manager, his betting is data-driven and he has contributed to previous BHA focus groups about betting. COLIN HORD, London, works at the Civil Aviation Authority and has a degree in meteorology. He is the policy lead in the Safety and Airspace Regulation Division. He is a member of Kempton Park Racecourse and writes a blog with his betting selections. MARTIN HUGHES, near Newcastle, worked at Barclays Bank plc for 19 years in various roles. For the past 8 years he has been a full-time bettor, adopting several approaches and becoming a specialist in in-running (without fast pictures). PAUL JOHNSON, Leeds, worked for William Hill for over 30 years and is now a professional horseracing bettor. A keen racegoer who has visited 55 racecourses in the UK, he also advises on horseracing at Regulus Partners. COLIN MAGEE, London, is an enterprise software executive and entrepreneur, and is a regular racegoer. He authored the first published book on how to program the Betfair API and is also owner of www.betwise.co.uk, a site which provides data analysis tools for bettors who wish to build their own systems. SIMON ROWLANDS, (Chair), near Sheffield, is a self-employed horseracing analyst and writer who formerly worked as a betting-shop manager, racing editor for a national newspaper and for many years for Timeform. He was recently appointed to British racing’s Disciplinary Panel. TANYA STEVENSON, Surrey, is from a bookmaking family and has many years of experience in the betting industry, including as betting expert on Channel 4 Racing. She has worked on BHA groups, Tattersalls Committee and is a judge of the Betting Shop Manager of The Year. STEVEN TILLEY, Gloucestershire, has been a racing fan since he was a teenager and a member at Cheltenham racecourse for 30 years. He has written about betting for magazines and spoken at betting workshops, and mixes with punters across the spectrum from those in it purely for fun to those who take it very seriously. He has been a local councillor for the last 25 years. Via its twitter account and the hashtag #HBFQA, HBF recently hosted a Q&A for the general public. Here are those questions, and answers, in full. Such a directive would require legislation, and neither BHA nor HBF is empowered in that way. The Gambling Commission, which might be, is not minded to do so, though HBF continues in dialogue with GC about this and other matters. Nonetheless, HBF is seeking to define what it sees as good practice in this area and hopes to get backing to encourage bookmakers that adopting reasonable guidelines will be to their benefit and not just punters’. Racecourses are commercial entities that will pay the consequences if they misjudge such matters. With racecourse attendances still high, and remarkably few tracks having closed in recent decades, they might well disagree with your analysis. HBF cannot dictate to them. Nonetheless, the race-day experience is a valuable shop window for the sport and HBF would like to see easier access to information (WiFi, replays, results, announcements, seeing the horses before the race, interviews with racing professionals) and continued vigilance to ensure betting markets do not exploit the novice and the seasoned racegoer alike. One way this may be best achieved is through greater co-operation between racecourses. Last year’s industry updates suggests this is happening. #hbfqa With handicaps dominating UK racing why does the BHA not require horse body weights? – these can vary 30+ pounds between races. HBF has suggested a pilot project in this area – believing that wholesale implementation at one go would encounter logistical problems and no small amount of opposition – such as in Group races or selected AW races. More widely, it is necessary to distinguish between dead weight and live weight, as the latter can occur in tandem with increased strength or other athletic enhancements. HBF sees this issue as meaningful, but it is down its list of priorities, including having taken soundings from a section of the betting public. @HbfBritain #HBFQA How do you define limits of what you should look at? Do you think you should represent pro Gamblers in any way shape or form? HBF takes on issues it sees as clearly important without necessarily waiting for public feedback. Otherwise, though, it responds to concerns raised with it directly, by the public and from within the industry. HBF seeks to represent all punters. There are many, many more recreational than “professional” punters but it is important that betting on the sport remains aspirational and that those who seek to bet profitably (nearly all of us?!) are not short-changed. HBF made a positional statement with relevance to this on its website http://ukhbf.org/hbf-positional-statements/ recently. #hbfqa Why do BHA allow accurately remeasured course distances to be called “about”? No other sport does this. Racing also measures in yards/furlongs for overall race distances but calculates rail movements in metres then converts them back into yards (!). HBF continues to apply pressure to increase accuracy, relevance and timeliness of data, including in terminology used. Some. HBF has discussed the first two with a small number of “friendly” bookies and drawn an example of the last-named to the attention of the Information Commissioner’s Office via the Gambling Commission. Some bookies seem to understand that blunt restrictions with inadequate explanation may seem expedient in short-term but could well have harmful consequences for all longer-term. We continue to lobby in this area. HBF has had no dealings with the Horserace Betting Levy Board, which is soon to discontinue. Prior to the creation of the HBF, the future Chair asked the HBLB that funding be made available into horseracing betting behaviour (what drives good and bad participation) but was told that was outside the HBLB’s remit. When it becomes clear who holds the purse strings, HBF may well be minded to push for research in a number of areas, of which best practice in watering could be one. HBF’s Chair raised issues with watering at a recent Going-Stick Working Party meeting but has heard no more of the matter since other than that the Working party’s scope will expand. A hypothetical question, as Exchanges are legal, here to stay and in Betfair’s case have, unlike some of their more conventional bookmaking rivals, regularly paid back into the sport. In addition to what some see as problems with them, Exchanges have appealed to a new type of punter and increased the interest of many existing ones. Sadly, HBF has made little progress in this area. The Forum has no statutory powers and can only seek to influence through dialogue and providing evidence. That is very difficult to do when some bookmakers refuse to engage with us. Nonetheless, HBF has put this suggestion to those bookmakers who HAVE engaged and have been encouraged by the response. If this is to happen more widely then it will be a long road, but HBF is committed to trying to bring improvements in this and other areas all the same. Little at present. Pretty much every group within horseracing believes it has a short-term interest in more racing or at least in preserving the status quo. HBF has made its views – similar to yours – clear in a positional statement on its website (http://ukhbf.org/) and in person to the BHA. HBF is not involved as a body in handicapping matters. But individuals on HBF have formally submitted views about official handicapping practices, some of which seem outdated. These include that greater transparency of ratings and the ratings process would improve understanding and promotion of the sport. We await developments. Others are better placed to answer this than HBF. However, HBF believes there is a very clear distinction between FOBTs (games of chance) and betting on horseracing (can be a game of skill, the acquiring of which may turn the individual in question into an advocate for the sport itself). HBF believes this distinction should have been emphasised much more in the past and must be in the future. Racing should be very conscious of how it is perceived and ask whether such a hand-in-glove association with FOBTs sends out the right message. HBF has pushed hard for improved data and made some progress, but there needs to be a change in culture within the sport about the need for accurate and meaningful data, delivered in a timely manner, and it is clear that will take time. Nonetheless, expect significant progress in coming months in some of those areas you have mentioned. On SP, see remarks made elsewhere about the need for a culture change, though some of what is asked for (e.g. racecourse demographics) have commercial sensitivity. The 2016 industry updates revealed that there will be greater co-operation between racecourses, but not necessarily greater public openness. HBF asked for greater transparency in betting markets, but those – and other legitimate – concerns raised with the Starting Price Regulatory Commission have been ignored. The Forum has not discussed the Kempton Park situation, in part because it has received no representations about it. HBF understands that a pressure group has been created. While HBF would be opposed to anything which seriously threatened to erode the appeal of betting on horseracing in Britain, it can be asked whether that will be the consequence of the sport losing one – admittedly significant – racecourse out of 60 and having it replaced by another. It is also a reality – however unfortunate or not – that racecourses are assets owned by companies and not the sport itself. There is a Twitter account (@BallotedOut) which provides a welcome service, but this should not be left to private individuals. On the back of your query, HBF has specifically asked that BHA host the same for all races with clear betting consequences, and BHA has indicated that this matter will be formally discussed as early as this week. Thanks. #hbfqa Why do BHA not take action against Sedgefield for not providing going stick readings? HBF’s Chair raised this at a recent Going-Stick Working Party meeting and did not receive an explanation. Sedgefield is not alone in this, though some of the other omissions are down to courses having frost covers that could not be removed in time to take readings. Chair proposed “quickie” readings from which a wider going reading could be extrapolated an hour or so before racing (most readings are several hours, or sometimes a number of days, in advance). Awaiting a response from the GSWP. The intention is to attract more runners, just not “dross” ones. That does not always happen, obviously! More widely, small fields in British racing do not go down well on the international stage. A minimum of 8 runners is the aim. This is really a concern for the likes of the race-planning department at the BHA. No consensus has been established at HBF, which is made up of a mix of glass-half-full and glass-half-empty individuals! HBF has been outside the loop on this but will be briefed about the situation at its July meeting and intends to make it clear that lowering deductions should at least be considered and that it will oppose attempts to squeeze the betting public for purely short-term gain. Don’t know! Not an HBF matter, but it underlines how there are intriguing angles in this sport. The sport will benefit from such questions being asked, and more easily explored and answered. HBF is very keen on there being an environment in which the beautiful complexity of horseracing analysis can flourish. HBF has raised the unsatisfactory nature of “privileged data” with BHA. Its existence runs counter to much that racing is trying to achieve and fuels the impression that racing is an “insider’s game”. HBF will raise this again at its next meeting – at which BHA will be present during a dedicated slot – and seek clearer official policy. This is part of the wider attempt to change culture around data, and that will take time. The Horseracing Bettors Forum (HBF) is today inviting applications from the public to fill a small number of places on the Forum to replace existing members as part of a planned, refresh of its membership ahead of its second anniversary. The HBF was established in September 2015 to understand the views of those who bet on British racing, and to represent those views to the individuals and bodies who make policy decisions in this area. The HBF was created with the assistance of the British Horseracing Authority (BHA), and maintains a good working relationship with the sport’s governing and regulatory body, but is independent of it. The HBF comprises up to nine voluntary members, chosen for their knowledge of the betting environment and their ability to represent the betting public. Forum members meet four times a year and correspond extensively between those meetings. To that end, the HBF invites applications from members of the public interested in such a role. From this point on, HBF members will be asked to serve a three-year term. Appropriate individuals are kindly requested to contact HBF at applications@ukhbf.org specifying in no more than 500 words why they would like to be considered for the role, including contact details (a CV is not required). All positions with HBF are unpaid, but reasonable travel expenses to official HBF meetings may be claimed by members in line with the BHA expenses policy. This is an opportunity to represent a group that is key to the future prosperity of the sport of horseracing and to make a positive difference. The HBF is committed to equal opportunities and encourages diversity. The closing date for applications is Wednesday 31 May 2017. Forum members will be appointed by the Chair following the HBF’s next scheduled meeting, which will be on Monday 3 July 2017, with a view to inducting new members in September or October 2017. Further information about the activities of the HBF and its remit can be found on its website at http://ukhbf.org/. The Horseracing Bettors Forum was created in August, 2015, with the assistance of the BHA to represent the perceived interests of those who bet upon, or who might bet upon, British horseracing. The HBF seeks to ensure that those interests are understood and taken into account in the relevant decision-making processes, for the good of both bettors and the sport of horseracing in Britain. The HBF consists of nine members – all voluntary and unpaid – who convene roughly once every three months to discuss issues that they feel are relevant to British horseracing punters. The HBF has no mandatory powers, but, where appropriate, it will seek to influence policy in accordance with its stated objectives. The seventh HBF meeting took place at the BHA offices in London on 20 March, 2017. The following is a summary of some of the matters considered and individuals contacted. In addition, HBF is currently engaged in a significant piece of work which involves liaison with the BHA, the Gambling Commission and with bookmakers. Two senior bookmaking representatives attended the latter stages of the meeting to this end. All being well, HBF will make a public statement on the matter when steps are sufficiently advanced. Next HBF meeting will be on the afternoon of Monday 03 July, 2017, at the BHA offices in London. It is anticipated that it will include attendance from representatives from the Gambling Commission – with whom HBF is discussing Rule 4 use among other matters – and the BHA. Other details to be finalised.